There's something about the written word that has been lost. In the age of technology, letter writing has fallen in decline. 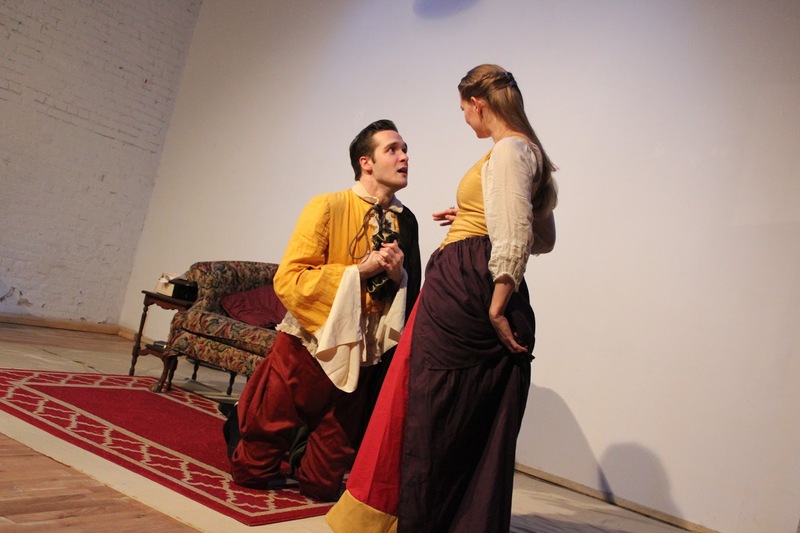 The magic of the written word is in full bloom in the new fairy tale Patronage by Kati Frazier presented by Random Access Theatre and Not Without Rage. Patronage is the tale of a Suitor, in class disguise, who attempts to win the heart of the Countess who can only be wooed by poem. When the Suitor is poemless, he arrives at the home of Thomasine who he begs to write him a poem. Through greed, intrigue, and a little bit of love, Patronage showcases a fresh spin on the fairy tale genre. From the story structure, to the scenic elements, to the colorful costumes, it's best to describe Patronage as a patchwork. The pieces are all present but they may not all fit perfectly together. Director Corinne Woods kept the tempo brisk, which, in this case, was not for the best. Woods encountered some difficulty in storytelling clarity. With high-speed action and primarily having monologues serve as integral exposition, it is likely key plot points may have been lost. Frazier's play is not based on a famous fairy tale. And that's a welcome change. But Frazier and Woods seemed to forget that this would be the audiences first time hearing this tale and will likely need time to digest the foreign material. What Frazier did offer though was a story that resonates. It's a story of pursing the one you want and never giving up even when the odds are stacked against you. The characters Frazier creates resemble other fairy tale favorites with similar wishes. That being said, they happen to be very one-dimensional. It works for a basic fairy tale but not when trying to reinvent the genre. In playing with the patchwork idea, the three actors seemed to offer three different acting styles. Individually they worked but battled when together. Which was the best option? That's up for debate. As an ensemble, the cast of Patronage did not blend. Individually, there were some solid performances. The Suitor was a bit dim allowing for a wonderfully over-the-top campy performance from Jamie Boswell. If you're ever looking for a cartoon fairy tale leading man, look no further than Jamie Boswell. He has the charm and willingness to throw himself around. There was flamboyance to his characterization but it worked here. On the contrast, Ivanna Cullman as Thomasine was much more reserved and grounded. For Cullman, it worked. As The Countess, Calaine Schaffer may not have screamed regality but she exuded superiority. Though the way she treated The Suitor, you have to wonder if all the money was worth the love of this small-hearted person. Director Corinne Woods kept the play quite intimate, utilizing the nooks and crannies of Rabbithole. The very unique rustic space was divided into two different worlds. The open space gave Thomasine and The Countess their own playing space that The Suitor bounced around in. The period-inspired furniture from Cale Jordan was a mix and match that was distinct for each. When it came to the costumes by Anna Grace Carter, the style was right but the bright colors were hard on the eyes. One of the most comical of costume pieces was the Suitor's yellow coat. The best way to describe it was a knock off of Freddie Mercury's 1986 Wembley jacket. It certainly was a statement piece. To Jamie Boswell's credit, he pulled it off. The soundscape by Chris Chappell was interesting. The sound that accompanied the writing seemed to feature a clicking resembling a typewriter, which was a bit jarring. Despite that, the effect was a tremendous addition. Patronage has its highs and lows. The moral of the story is present but the journey getting there wasn't as polished as one would hope.